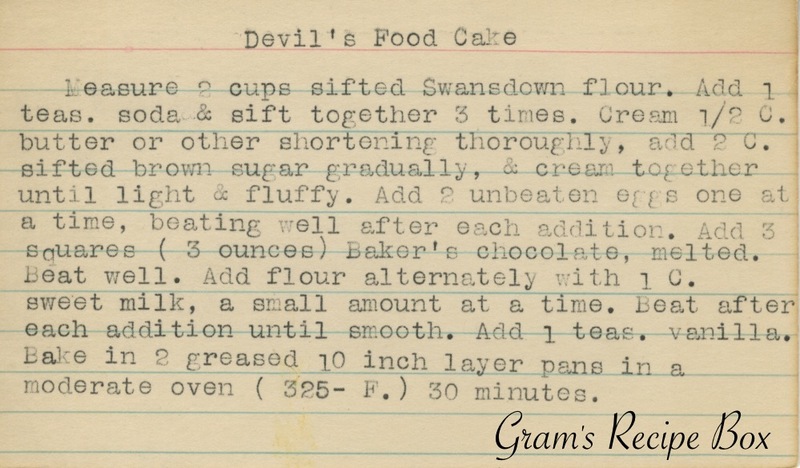 As discussed on a previous post, Devil’s Food Cake is considered the yin to Angel Food Cake’s yang (or the yang to the yin, heh). Where Angel Food is light and airy, Devil’s Food is dark and rich. After reading this recipe and comparing with my previous research, I have come to the conclusion that this recipe is very close to a standard chocolate cake rather than a traditional Devil’s Food. While it does include the baking soda (adds air and fluff to the batter) it doesn’t call for cocoa powder or shredded beets. Regardless, it will taste wonderful I am certain when iced with a nice chocolate buttercream. Mmmmm! Measure 2 cups sifted Swansdown flour. Add 1 teas soda & sift together 3 times. Cream 1/2 c butter or other shortening thoroughly, add 2 c sifted brown sugar gradually & cream together until light & fluffy. Add 2 unbeated eggs one at a time, beating well after each addition. Add 3 squares (3 ounces) Baker’s chocolate, melted. Beat well. Add flour alternately with 1 c sweet milk, a small amount at a time. Beat after each addition until smooth. Add 1 teas vanilla. Bake in 2 greased 10 inch layer pans in a moderate oven (325-F) 20 minutes. I love the richness of a Devil’s Food Cake. I’ll try icing it with chocolate buttercream, since you are certain that it will taste wonderful with it.